Which Exercise Classes are Right for You? | Elite Sports Clubs: Where You Belong. 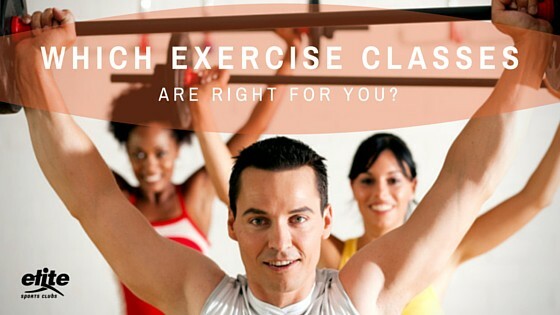 Which Exercise Classes are Right for You? Looking for the right group exercise classes is a little bit like shopping. If you don’t have a specific item in mind, wandering the aisles of a store can be overwhelming. Similarly, reading the descriptions on a group exercise schedule can quickly become a confusing mix of adjectives and exclamation points, making it hard to choose the best option for you if you don’t have a specific exercise goal you’re trying to achieve. As any experienced shopper will tell you, the way to have the most success is to have a clear idea of what you want before you walk in the door. When presented with a myriad of exercise options, it’s easy to make an “impulse buy.” If you make too many decisions that don’t fit your needs or goals, you might lose your motivation altogether! So, how can you be more efficient with your time at your health club and foster your excitement about the potential exercise has for you? First of all, what are your goals? Plain and simple, most of us walk through the front door of a gym with some goals in mind. We can break down the most common fitness and health goals into three categories. What these types of classes will do for you: Truthfully, most any class you attend regularly can help you lose weight! That being said, weight loss is dependent on what your calorie intake is, as well. To lose weight you need to operate at a calorie deficit, i.e. fewer calories and more activity! Look for maximum calorie expenditure for your time investment. The classes you choose should use large muscle groups, total-body movements, get your heart rate up, and have you breathing from a steady to a breathless pace for the bulk of the class. If you are serious about your weight-loss goal, invest in a heart-rate monitor for a more accurate picture of which classes are truly challenging you. What these types of classes will do for you: Most of these classes are designed to work the whole body because it’s important to strengthen all muscle groups. Yoga classes provide strength training that’s coupled with flexibility. Heavier weights and muscular overload are what you are looking for in a class dedicated to building strength. Most of the classes listed above provide an opportunity to do compound exercises (i.e., moves that use more than one muscle group at the same time). If you’re new to class, choose a few different sizes of weights to determine what feels safe, but also provides adequate resistance. Talk to your instructor if you’re new. He or she will be happy to assist you in choosing the appropriate weights. What these types of classes will do for you: Cardiovascular endurance, core strength and flexibility are the name of the game when you are preparing for a running event. The need for cardiovascular endurance is obvious, but while you might not need excessive upper-body strength for these types of events, you will need to fight upper-body fatigue and maintain a strong core during a challenging run or walk. Also, repetitive walking or running can cause muscular imbalances and tightness, which is why flexibility training is the key to making it to race day in great condition. Cycling also provides a lower impact cardio challenge to put into the mix. Whatever your goals are, make sure you mix up your routine; variety is the key to making gains in your fitness—and losses on the scale! Try new things, and open yourself up to new challenges every time you walk in to the club! Can’t wait to see you here! Get Started! Tell us about your goals! 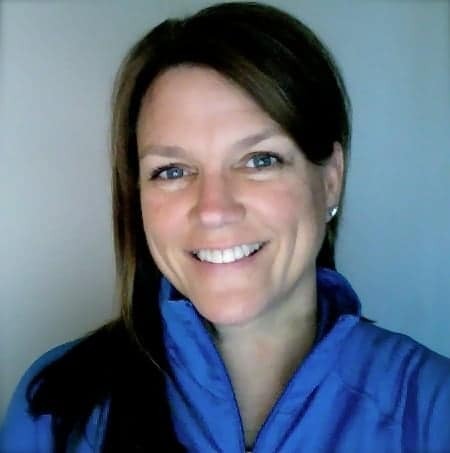 Annie Farley has been the Director of Group Exercise, and a personal trainer at the Elite Sports Clubs location in Mequon since 2010. As a two sport collegiate athlete, she developed a passion for strength and conditioning, coaching, wellness, and exercise physiology. Sharing the knowledge of exercise science, and the enjoyment of being active has been the focus of her tenure at Elite. Indoor cycling, boot camp, and strength training exercise classes are among her specialties. When she’s not teaching an exercise class, or training a client, Annie can be found on the tennis court, at the riding stable, or spending time with her husband and 4 kids.